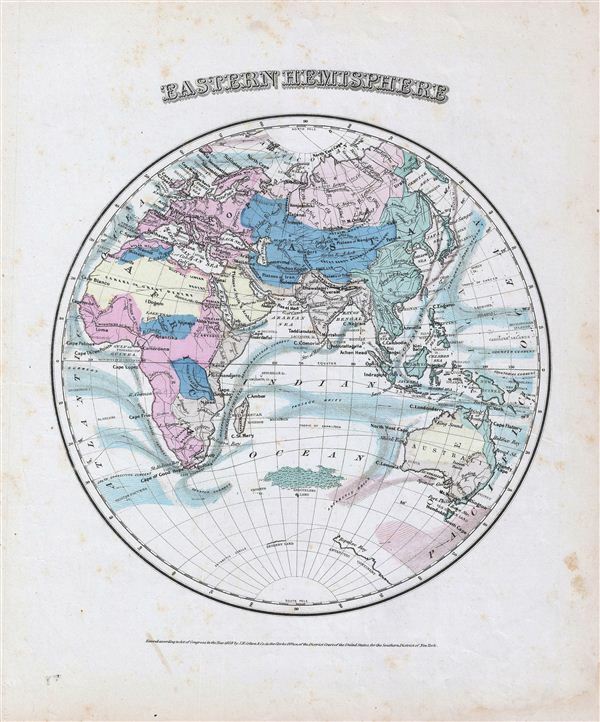 A rare example of Colton's 1858 map of the eastern Hemisphere. Depicts Asia, europe, Africa and Australia. Although major cities are labeled, political distinctions are not. Shows major cities, rivers, mountains, capes, oceans and ocean currents. Offers a fascinating snapshot of the world during a period of rapid globalization and discovery. This beautiful hand colored map is a copper plate engraving, featuring a delicate floral style border only used by Colton in this particular atlas. Dated and copyrighted to J. H. Colton, 1859, this map is by G. Woolworth Colton and the text is by Richard Swainson Fisher. Published from Colton's 172 William Street Office in New York City an issued as part of the1859 edition of Colton's Illustrated Cabinet Atlas and Descriptive Geography. Very good. Blank on verso. Minor stains.